St Lucia lies at latitude 13 54’ north of the Equator and 60 50’ west. 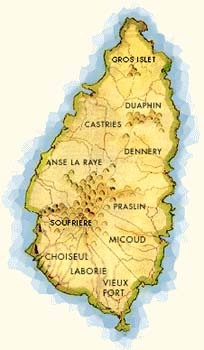 One of the Windward Islands, it is located in the middle of the Eastern Caribbean chain of islands and is approximately 21 miles south of Martinique and 90 miles northwest of Barbados. Castries (population 50,000) is the island’s capital and is situated North-west of the island. The main language in Saint Lucia is English although many St. Lucians also speak French and Spanish. Kwéyòl, St Lucia's second language, is widely spoken by the St. Lucian people including all walks of life such as doctors, bankers, government ministers and the man on the street! Kwéyòl is not just a patois or broken French, but a language in its own right, with its own rules of grammar and syntax. The language is being preserved by its everyday use in day-to-day affairs and by special radio programmes and news read entirely in Kwéyòl. The island is 238 sq. miles (616 sq. km), 27 miles long, 14 miles wide with a combination of high mountains, forests, low lying lands and beaches. A central mountain range runs the length of the island, with peaks ranging between 1000 and 3145 feet. Forests dominate the mountains, while jasmine, scarlet chenille and wild orchids provide splashes of colour to the lush green slopes. The two towering volcanic cones on the southwest coast, Gros Piton (797m) and Petit Piton (750m) are one of the Caribbean’s most famous landmarks. The volcanic origin of the island provides visitors with an opportunity to visit a “drive-in volcano” and take a dip in the reputedly therapeutic Sulphur springs. The climate on island is tropical with temperatures ranging from 70 – 90 Fahrenheit. The rainy season is from June to November and the drier period between December and May. Average rainfall is between 160-360cm depending on altitude. Currently estimated at 150,000 with a workforce of about 65,000. Annual population growth rate is approximately 2%. English is the official language of St Lucia however, a French-based patois is widely spoken.